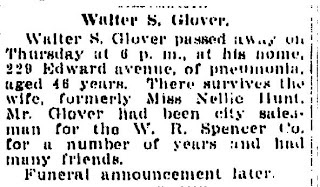 Walter Stillman Glover, the youngest son of Samuel Stillman Glover, Jr and Adaline L. Dyer died 5 February 1920 in Jackson, Jackson, Michigan. 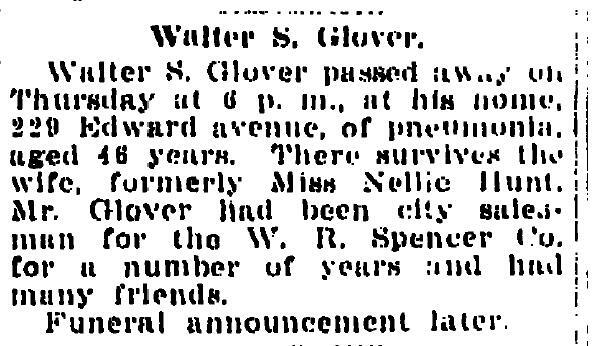 Source: "Walter S. Glover," obituary, Jackson Citizen Patriot (Jackson, Michigan), 6 February 1920; online images, Genealogy Bank (www.genealogybank.com : accessed 3 February 2013), Historical Newspapers. wife, formerly Miss Nellie Hunt. man for the W.R. Spencer Co.
From Brendan Glover, Cape Town, South Africa. Son of Harold Glover and Adriana Samuels. Too Bad This Wasn't Mine-I am a Glover After All! Why FGS 2013 You Ask? Let Me Tell You. Where in the World is Johann August Fredrich?